Such cold, wet, miserable weather on a June summer’s day calls for warm, comforting hot chocolate. The best thing about this recipe, and making it yourself, is that you can easily adapt it to suit your own tastes. 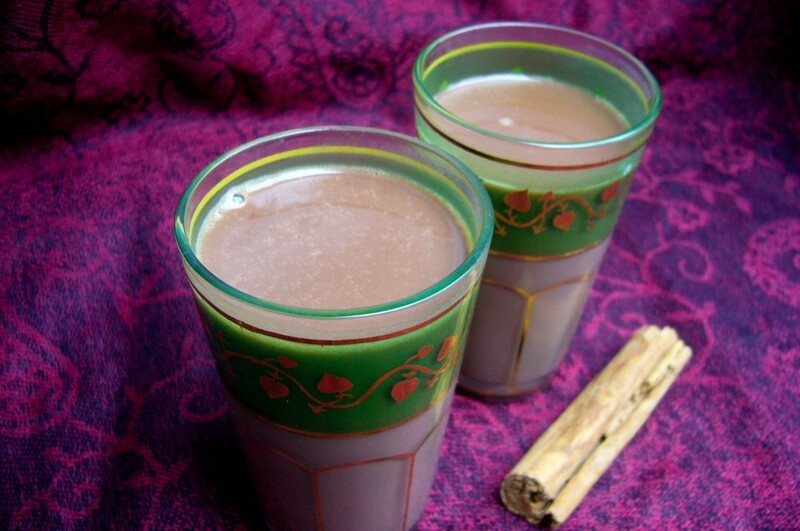 I made mine with spices that you might find in a masala chai to make a masala hot chocolate, but you could leave these out, or just use cinnamon for example. I also used a chocolate with 50% cocoa solids for a rich but milky taste – however, you can use any kind of chocolate you like, as long as it’s good quality. And finally, I used semi-skimmed milk, but you could use soya milk, almond milk or even water for a vegan option. Sometimes I like to use mint tea in place of the milk for a lighter, minty hot chocolate. You can get really creative here! Heat the milk over a low heat (with all the spices, if using) until almost boiling. Let infuse for at least 10 minutes if using spices. Meanwhile, melt the chocolate in a bain marie. Pour over a third of the spiced milk through a sieve onto the chocolate. Whisk briskly from the centre out to emulsify the chocolate with the milk until smooth, then pour the rest of the milk in and whisk well to combine. Pour into pretty glasses and dream of sunnier days.